What resources do I have & need? Mindful makers want to know what resources will serve as a muse to their imagination. Key to this is an understanding of the properties of materials. What will inspire me to give my time & effort to a project? Sometimes we don't have the necessary skills to complete a project and need to make an effort to learn. Mindful Makers look for interesting projects that will keep them engaged and motivated (music, sports, a special cause?). Mindful Makers ask themselves this question throughout the making process. That way they can figure out what they don't know and take steps to learn. A Mindful Maker is aware of the emotional connection between the maker and the objects that they make. If it makes you happy then you can have fun! Can I let myself make a mistake? Mindful Makers understand that mistakes are ok and can make a project better. Sometimes this leads Mindful Makers to ask another question—What ways beyond the 'right' way can I make something? Mindful Makers understand that some of their projects will be viewed, used, & shared by other people. Who are those people? Mindful Makers think about how their own interests and ideals interact with the needs of the potential audience. How will my creation affect other people? Mindful Makers think about how their projects might affect people. Will it interest them? Will they learn something? Will they have fun? Will it make them happy or sad? What kind of maker am I? 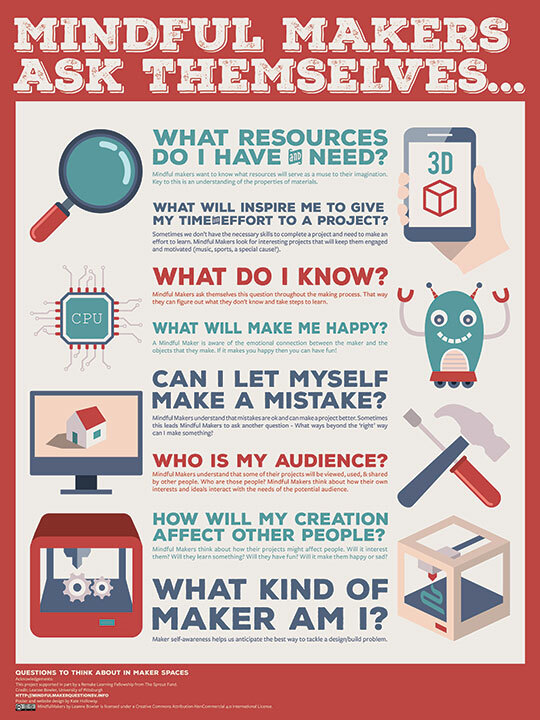 Maker self-awareness helps us anticipate the best way to tackle a design/build problem. This project supported in part by a Remake Learning Fellowship from The Sprout Fund. MindfulMakers by Leanne Bowler is licensed under a Creative Commons Attribution-NonCommercial 4.0 International License. Poster and website design by Kate Holloway.